Sabeen Masood BDS 4rd year student, Altamash Institute of Dental Medicine, Karachi. Munesh Pal Khamuani House Officer, Altamash Institute of Dental Medicine, Karachi. Rida Amna House Officer, Altamash Institute of Dental Medicine, Karachi. 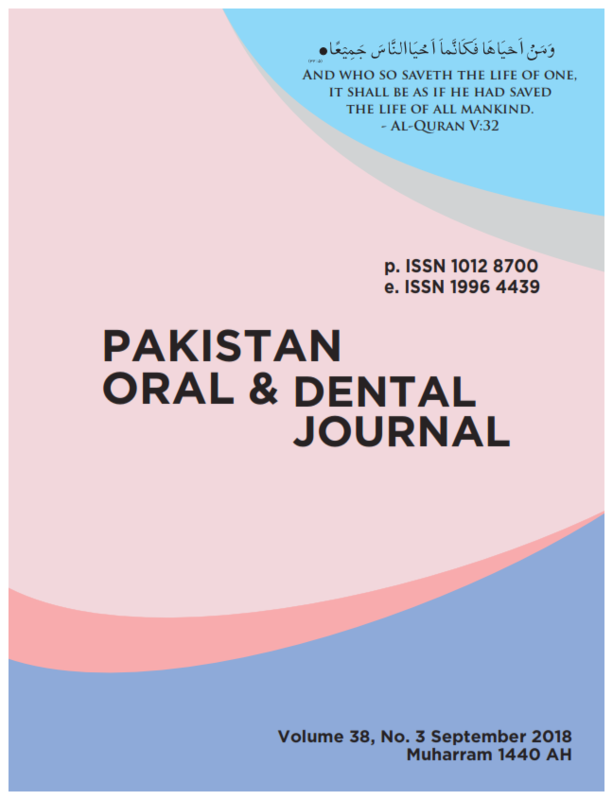 The purpose of the study was to evaluate and analyze the oral hygiene condition and practices among the patients seen at Dental Outpatient Department of Altamash Institute of Dental Medicine, Karachi. It was carried out from mid-January, 2018 to mid-February, 2018. A description based cross-sectional survey was carried out on 100 patients. Patients were asked their name, age, gender, occupation, employment, education and residential area and were recorded in the questionnaires. It was further categorized to evaluate the knowledge, awareness, practices, and behavior pattern associated with oral hygiene. Among all participants (60) were female and (40) were male. Study showed that toothbrush and toothpaste (94%) were the main products used for the maintenance of oral hygiene. Only 6% of the people used other oral hygiene aids.